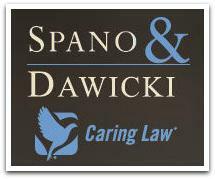 Spano & Dawicki, LLC is dedicated solely to Elder Law Lifecare, Trusts and Estates. Attorney Spano is one of only the first Massachusetts Elder Law Attorneys to become Certified as an Elder Law Attorney by the National Elder Law Foundation and has served as President of that organization. The Firm's extensive staff and specialization solely in Elder Law, Lifecare, Trusts and Estates provides clients the security in knowing that their concerns are being addressed by experts who are dedicated and caring. The firm is conveniently located directly on Route 1 in Saugus at a highway interchange and is only minutes from Logan Airport, Downtown Boston and all major highways. The office and all facilities are ADA compliant and the Firm has been cited in a professional journal article regarding the unique design of the office to accomodate individualy with a wide array of disabilities. The Firm takes pride in not only providing unparalleled service, but also expert knowledge. An example of that knowledge is the depth and breadth of continuation education in which the entire staff participates on a regular basis as well as the exemplary results achieved through the Courts on behalf of its clients. The Firm is an acknowledged expert in pursuing successful claims in the Courts and enabling individuals to live their lives with maximum independence and dignity. A Partial Sampling of Advanced Legal Training in which the Firm has participated since January, 2000.